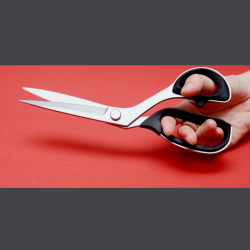 The 7000 Series is a new generation of all-purpose scissors. The blades are made of AUS8A stainless steel (3.7 – 4 mm in thickness) and hardened up to 58+/-1 HRC. The shears are elegantly matt finished and equipped with a patented duplex interlock fastener that prevents the screw from becoming loose. The fastener is also heat treated and hardened up to 45 +/- 1 HRC. A winner of the IF design award 2005. Scissors with a straight blade.Size: 20,5 cm..
Scissors with a straight blade.Size: 23 cm..
Scissors optimised for aramide fabricSize: 24 cm..
Scissors with a straight blade.Size: 25 cm..
Scissors with a straight blade, left-handed model.Size: 25 cm..
Scissors with a straight blade, Slim and Light.Size: 25 cm..
Scissors with a straight blade.Size: 28 cm..
Scissors with a straight blade.Size: 30 cm..
Small blue scissors with a straight blade.Size: 13,5 cm..
Small black scissors with a straight blade.Size: 13,5 cm..
Small pink scissors with a straight blade.Size: 13,5 cm.. Medium blue scissors with a straight blade.Size: 16,5 cm.. Medium black scissors with a straight blade.Size: 16,5 cm..